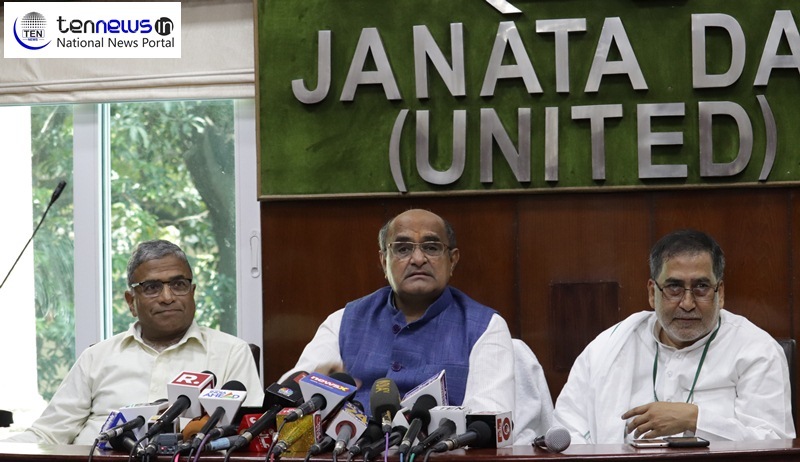 New Delhi :– Rejecting the speculation of any crack in the NDA in Bihar and rumors of Nitish Kumar rejoining Mahagathbandhan before election, Janta Dal United (JDU) on Sunday said that the party in an ally of BJP and will fight 2019 General Election together. Speaking on the seat distribution, the party said that ‘no proposal has been received from the BJP and will only be able speak if party receives any proposal. Chief General Secretary and National Spokesperson of JDU KC Tyagi said on Sunday while addressing media after the National Executive meeting in New Delhi. “There is no doubt JDU is a part of NDA and will fight 2019 general election together. Narendra Modi will be our PM face and Nitish Kumar as Bihar CM,” said Tyagi. During the National Executive meeting, headed by the Bihar Chief Minister and party chief Nitish Kumar, the party has passed a resolution is support of unanimous election proposed by the law commission and opposed the Citizen Act Bill 2016. Moreover, despite being party of NDA, the party has decided to fight the upcoming assembly election in the four states – Madhya Pradesh, Chhattisgarh, Rajasthan, Mizoram on limited seats.